I'm one of the proud few who choose to not carry my Treo 755p "naked" but rather contained within a thin pouch-style case in my pocket. Unfortunately, while pouch-style cases for Treos are plentiful, the vast majority of them have obese dimensions, with bulges and extra bulk added from various types of rear belt clips, mounting studs, and belt loops. I've long been searching for a fully-enclosed, pouch case that is as thin as possible while still retaining a top closure. After conversing with fellow Treo users online, I determined that I was going to have to custom order a case tailored to fit my exact requirements. It came down to a close shootout between two similar pouch cases from New Zealand's Nutshell and Miami-based Fortte. 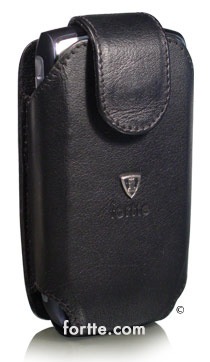 In the end, I went with Fortte's Treo 680/750/755p pouch case, being impressed with their website and finding several reviews online giving the firm's products enthusiastic reviews. I deliberated for a day or two and then placed my order, undeterred by Fortte's advice that the construction and shipping of my case would take a good 3-4 weeks. I decided that good things come to those who wait, so I continued living with my trusty old Case-Mate case on my 755p while waiting for the new arrival to appear in my mailbox. Read on to see if my dreams for the perfect pocket pouch case have been met by Fortte's offering. Wanting to finally "do it right" and get the EXACT case I was looking for, I decided to take no chances and order a custom case direct from Fortte. Amusingly enough, my entire set of "customizations" ended up being notable for what I didn't add to the case. I deleted the swivel clip mount and the belt loop, I stuck with the default black color, I deleted the Fortte shield logo, and I refrained from adding any embossed personalized text to my case. By keeping it plain and simple, I kept my purchase price to a relatively low $32.94, including UPS Ground shipping. It took precisely 30 days from the date when I placed my order to UPS' delivery of my package. I was pleasantly surprised to see this "custom" case delivered double-boxed. The case was nicely wrapped in paper with a foam insert in a stylish black cardboard box with an affixed decal confirming the exact details of my order (vertical pouch, black, without belt clip, no shield or Forrte name embossed). This attention to detail was a very pleasant surprise and helped reassure me that the month-long wait for the case was going to be worthwhile. My first few days of initial of this case were sort of frustrating, as I had expected them to be. I figured three or four days of the break-in period living with a tight case was well worth it for the long run. The high-quality leather that the case is constructed of is nicely textured with a moderately deep grain. After several Treo and PDA cases that more closely resemble some mutant strain of cowhide that more closely resembles cheap vinyl, finding such fragrant, high-quality, leather is quite a treat. While the leathers used in my "other" Treo cases (Tumi belt case and Case-Mate shell) are in no way shoddy, they're not up to the standards of the fine Bolivian hides used by Fortte. I had no problems maintaining a grip on the case when the Treo was inside. The stiff, slightly protruding hard back panel provides a good grip for one's fingers. Once I had used the case regularly for a few days, the break-in period was complete and really began to enjoy not having to fumble to remove my 755p from the case. Since this was a custom order designed to be as no-nonsense as possible, I have very little to say about the exterior of the case. There is ZERO "bling" aside from the chrome magnetic latch and a small embossed "Genuine Leather" stamp on the back panel. No logo, no initials, no contrasting stitching-just a simple, high quality black leather case. It's bland, monochromatic and exactly what I wanted! The more compact, antenna-free design of the 680/750/755 Treos makes these units perfect for a sleek flap case such as this Fortte design. My only complaint in regards to the external dimensions of the case is that there is a slightly noticeable bulge when the top flap is secured to the front of the case. It's not a deal-breaker, but the magnetic closure design does bring about a bit of inherent bulk. While some may view it as a disadvantage, when inserted in the case none of the Treo's buttons are accessible aside from the top-mounted ring/vibrate switch. There is not a cutout for the notification LED but it can be seen while the Troe is in the case, as the location of the LED (at least on my 755p) is a smidgen above the top of the front panel. I did not notice any issues with the Treo's call volume being inaudible or muted by the enclosure of the case. Vibration notifications are dulled somewhat, but I was still able to feel my Treo vibrate in my pocket to notify me of new e-mails. After living with this on a near-daily basis for over two months, I have to admit that I am a bit worried by some minor signs of wear that appeared within my first few weeks of ownership. Some of the stitching on the back panel has started to come loose and, more worryingly, the glue between the soft interior felt lining and the exterior leather shell fell out, causing the edge of the felt lining to peel away. While I was able to resolve this problem with a tiny dab of superglue, it is still unsettling to see this in what is supposed to be a premium-quality leather case. My cheaper, Chinese-made Tumi Treo belt case (admittedly not having been used nearly as much) is holding up much better and appears to exhibit a superior level of fit and finish when it comes to securing the interior felt to the leather exterior. Some users will dislike having to remove the Treo from the case to perform even the simplest of functions. Since I do not use my Treo as my primary mobile telephone, this doesn't bother me in the slightest. Of course, one drawback of a pouch-style case is what exactly to DO with the case when the Treo is in use. I usually just shoved it back into my pocket or, when wearing an appropriate shirt, stuck it in my short pocket until I was done using my Treo and ready to stick it back in its case. After a week or so living with the Fortte case, I realized that I was absent-mindedly inserting the Treo into the case both with the screen facing outwards and facing inwards. I don't know what the "proper" intended orientation is but I would certainly imagine the LCD would receive more protection when facing towards the stiff rear panel of the case. However, it is slightly easier to insert the Treo with its screen facing outwards. Another nifty trick I discovered was that it was possible to charge my Treo while still in the case if I merely flipped the unit upside down so that the multi-connector was facing outward, as seen on the picture below. A case like this provides just enough protection when in one's pocket without adding a tremendous amount of extra bulk or weight. Like a good pair of sensible black leather shoes, the Fortte case's professional, understated looks match any type of attire or work environment and remains a pleasant yet inconspicuous choice for male or female Treo users. While Treo case perfection still eludes me, this one is the closest effort yet to what I envision as my personal dream case. I want a moderately protective case for carrying in the pocket that's as lightweight and no-frills as possible while still made of quality leather. With the imminent arrival of slightly restyled Treos models such as the 800w, 850, and "Wanda", the classic 680/750/755p formfactor may not be much longer for this world. Nevertheless, I think I've found my daily case in the Fortte pouch design for as long as I continue to own my 755p…hopefully these minor construction flaws won't become major problems and this case will hold up over the long haul. When I purchased my Treo 755p I wanted something to protect it while it is in my pocket. I tried the Smartphone Experts UltraSlim Pocket Pouch. It seemed perfect. Light, thin and provides protection. But after a few months of use, the case literally fell apart. The two halves are glued together, not stitched as it appears! I discovered the Fortte case reviewed here and purchased it without clips, embossing, etc. However, I found the case bulky and stiff for my pocket. I almost considered selling it until I read your review. Maybe I need to break it in. However, I decided to write the company to tell them - great job & nice case but that it is too bulky for use as a pocket case. I sent them a link to the UltraSlim Pocket Pouch and told them I felt they could do this better. They responded and showed me a picture of a case that is in the works, something called a Slim Pocket. It looks just like the UltraSlim but hopefully with better quality. I'm still using my UltraSlim, glued together and not sure what to do next. The Fortte case isn't perfect but it's certainly a far sturdier, better built case in every way. I'm definitely intrigued by the Slim Pocket case. Keep us posted when it becomes official and I'll be sure to cover it!